In the midst of the 2018 carnival season, HERO (Health & Educational Relief Organisation), recently went to Grenada on a humanitarian medical mission. From all indicators, this first of its kind initiative, was a huge success. The team was led by Guyana born, John E Mitchell MD, trauma and critical care surgeon and president of HERO. He, along with Erica L Mitchell MD, Vascular and Endovascular Surgeon, Professor of Surgery at the Oregon Health & Science University School of Medicine, pulled of, what one observer called, ‘a life changing feat,’ with this fistula installation. The fistula implants once matured (a 3 to 6-month process), will ease the burden on patients and care givers, by providing a stable access for patients to undergo dialysis. While reflecting with a sense of gratitude, Ogiste-Hopkin tried to recall how this all started. It was as far back as March of 2018, when this author, put her in touch with HERO’s president, Dr John Mitchell. She then contacted Dr Kester Dragon, Medical Director at the St George’s General Hospital, and her fellow activist, Barbara Brathwaite.Together, they then set wheels in motion. The mission culminated in early August of 2018. Carnival or no carnival, patients need help. The always-on-the-move octogenarian sees this as “a damn good mission! An excellent mission that should have happened a long ago; we are late!” Ogiste-Hopkin, emphasised. She said that overall, she rates the mission 100%. “This is quite beneficial to Grenada,” Ogiste Hopkin opined. Two doctors attached to the St George’s General Hospital ably assisted the team. Renaldo Clarke MD, and Terron Hosten MD, general surgeons in Grenada, they both played strong supporting roles during the operations. Hosten and Clarke worked successfully alongside the visiting doctor duo; Hosten learning, while sharing the operating responsibilities with Dr Erica Mitchell. The nurses, on both days showed their competences, as they stood head and shoulders next to the equally proficient surgeons. Dr Richard Amerling, nephrologist, is the 5th member of the operating team. Dr Amerling has ties to St George’s University (SGU). Like Dr Hosten, and Dr Germaine Bristol, they previously worked with some of the patients who received the fistulas. Dr Bristol, herself a patient, prepared all the other patients, and herself, to receive the access valves. While doctors Erica L Mitchell and Hosten, were the primary operators, an eclectic mix of doctors, nurses, orderlies, all made sure that everything remained up to standard. The doctors combined to complete 7 surgeries, on 7 patients, in 2 days. That was two days of intricate, delicate operations, Ogiste-Hopkin reminded some of us during one of the post operations meetings. None of this could have happened without the assistance of the house clean-up crew, and the kitchen staff. Theatre #2 or The Orthopedic Theatre at the General Hospital was where the surgeries were completed. 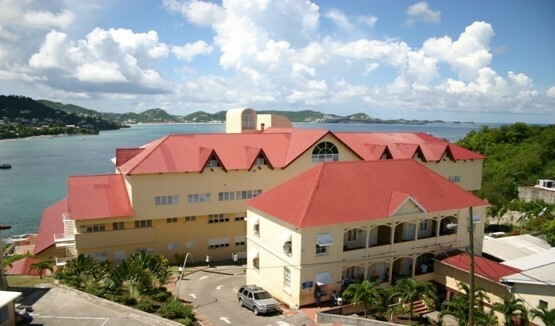 There are five operating theatres at the General Hospital in St George’s. During the operations, the ward managers were Sisters Louisa Millette, and Anita Cromwell. Staff nurses Katucha Guillaume, Sonia Belfon, Carnice Belfon, Candice Alexander, Estuka Phillip,RN, Tabitha Olliviere, RN and Midwife, and Michelle John, made up the cast in the operating room. Elma Corion-Griffith managed the recovery room. The team in the recovery room was Ann Ogiste-Hopkin, RN, staff nurses: Diedre Andrews-Date, Malisha Thomas, Lorette Amede, and Dionne Mathurine, RN. Anoris Martin-Charles is the Acting Director of Nursing (Matron). Dr John Mitchell explained the process. He said that the objective, during the operation, is to link an artery to a vein. This creates a vascular access port that the medical professional, in the future, is then able to administer the dialysis to the patient, with as little discomfort as possible. This is the first time that the Grenada Ministry of Health and the General Hospital have ever collaborated with an outside organisation, HERO, to deliver such service to citizens of Grenada, Carriacou and Petite Martinique. They could not pick a more suitable, qualified, efficient group. Dr George Mitchell, Chief Medical Officer for the tri island state, and Nickolas Steele, Minister of Health, expressed similar sentiments of “gratitude” during a reception for the medical and support teams, facilitated by Ogiste-Hopkin, at her home in South St George. Minister Steele and Dr Mitchell had to give their stamp of approval for the mission to move forward. This mission almost did not happen. Once Dr Keith C Mitchell, Prime Minister of Grenada Carriacou and Petite Martinique, learned of the mission, he quickly intervened and marshalled the might of the Health Minister and ministry. His foresight cinched the mission’s success. Prime Mitchell too, supports future engagements with HERO. Health and Educational Relief Organisation (HERO), is a US-based 501(c)3 tax-exempt, not-for-profit, charitable organisation, providing quality healthcare and humanitarian assistance to communities in need. Since its inception in 2000, HERO has conducted annual medical missions to numerous Caribbean and South American countries where their volunteer physicians, surgeons, nurses, pharmacists, nutritionists, and allied healthcare professionals, have directly administered quality care and support to thousands of residents in under-served communities. All services, including the dispensing of medications as needed, are funded by volunteer contributions and delivered at no cost to the patients. Among countries served by their previous medical missions are Guyana, Grenada, Antigua and Barbuda, Haiti and Jamaica. HERO typically conducts two overseas medical missions annually; the tours are undertaken in March and August, each lasting for approximately 7 days. Mission volunteers are divided into teams and each team is assigned to a specific region of the country for the duration of the tour. In addition to our licensed professional clinicians, each team is also supported by student volunteers enrolled in pre-medical and other healthcare programs at accredited colleges and universities in the United States. Up to the penning of this story all patients are doing well. There are no signs of any disappointments, complaints or regrets.